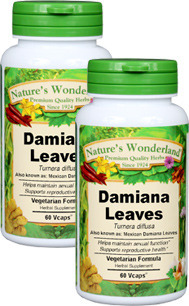 Damiana Capsules - 475 mg, 60 Vcaps™ each (Turnera diffusa) - Penn Herb Co. Ltd. Discover The Ancient Mayan Secret For Sexual Satisfaction! The South American tonic is used worldwide to improve sexual performance, restore sexual energy and heighten sexual satisfaction. Damiana is synonymous with revitalizing reproductive health as well as rejuvenating male & female libido. Today, you'll find this popular herb either by itself or in combination with other sexual tonics such as Muira Puama and Horny Goat Weed. COMMON NAMES: Damiane, Damiana de Guerrero, Hierba de la Orcado, Hierba de la Pastora, Mexican Damiana, Mizib-coc, Turnera aphrodisiaca, Yerba Damiana. Maintains healthy sexual function; supports libido; promotes hormone balance; gentle energizer; promotes prostate health; urinary tract health; promotes positive mood; nervous system support.